Leading Manufacturer of dehydrated garlic granules from Indore. 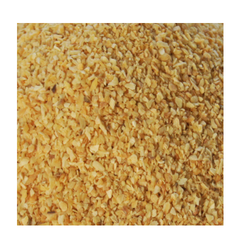 Our company involves in manufacturing, trading and exporting Dehydrated Garlic Granules. Added in soups, stews, noodles and other dishes, garlic granules are processed by keeping the peeled garlic pieces in the dehydrator, at a particular temperature for a specific amount of time. Rich in anti-oxidants, the proffered granules are widely used for enhancing the taste of dishes.